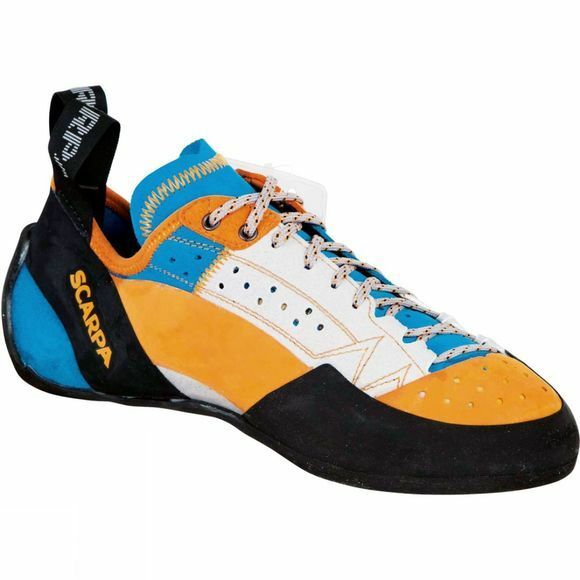 If you are looking for all day comfort and precision for trad and multi pitch routes then try these Techno X Rock Shoes from Scarpa. They have blended the all-day comfort of a flat lasted shoe with moderate heel tension. The addition of Bi-Tension Active Randing let's this shoe kick in like a turbo when you need it and softly rumble into the background for that smooth and comfortable ride when you don't. The asymmetric lacing gives the ability to adjust the shoes comfort in all terrains and to fit a wide variety of foot shapes. The toe profile is superb in cracks and pockets alike while the generous toe rand adds comfort, protection and friction. Soled with Vibram XS edge rubber, this shoe represents a new generation of comfort and precision balance.